Once again I've been a bad blogger and although have been nomming on great eats, I haven't been sharing and share is ultimately care. :) So here it is, the mediocre and wonderfully soul satisfying of the bunch for the last week. When it comes to picking my next experience whether that be shopping, nomming or entertainment I like to take into consideration two things, location and reviews. 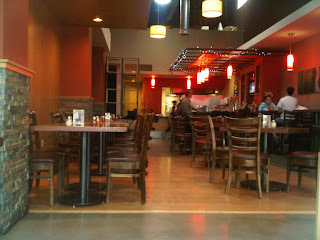 Pizza Fusion satisfies both criteria, it is right by my house and has 4 out of 5 stars on yelp. Offering healthy choices like a multigrain or gluten free crust, I was drawn to the restaurant's theme of organic and conscious ingredients (like free range chicken). Their message and eco-consciousness alone is probably why I'd give the restaurant 3/5 stars. I'll probably get imaginary bullets to the head from people all over, but I wish I could agree with the masses in saying that Pizza Fusion is amazing, but aside from their eco health niche, I would say their food is mediocre at best. The marinara sauce used for their pizza has a more sweet than savory flavor and kind of reminds me of the red sauce given at pretzel places as a dip. When experimenting new restaurants and especially when ordering pizza, my constant includes a pepperoni red pie, with fresh/roasted garlic and basil. You'd be surprised at how different these basic flavors can be at different places. While San Diegans love Bronx and etc, the place I've found that makes this combination of pizza best is Bar Basic. 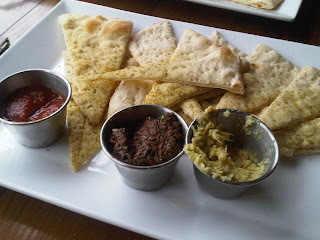 The highlight of the lunch was the flatbread served with an olive tapenade (my favorite), artichoke dip and marinara sauce (least favorite). The food gods are good to me though and would never leave me unsatisfied. Now for the fantastically yummy part of my week. A while ago I purchased a Groupon for what I thought was Indigo Grill in Little Italy, due to fast clicking and not thoroughly reading, it was actually Indigo Cafe in downtown. Right on the cusp of downtown, kinda by the courthouses and across from the Dominos pizza, I had no idea what to expect from this tiny corner cafe. Talk about blessings in disguise, the ratings on the yelp for this restaurant do not do it justice. The food is savory, un-pretentious and comforts the soul. 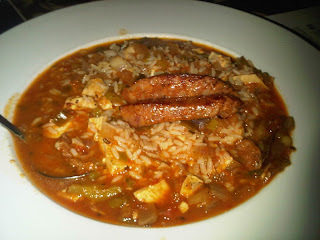 My favorite for the evening was the "Bubba Blues Jambalaya" that had Andouille sausage, chicken, peppers and onions in a tomato base over rice. While it's not the super thick Jambalaya I've had, the flavors were fantastic, the rice cooked to perfection (slightly above al dente) with just the right amount of heat. The only thing that would have made it this dish better is a loaf of bread to soak up the soupy sauce. I'd like to put out there that I'm not a burger person, in fact it takes a magical burger to make me swoon like I do over my favorite scarf or handbag. The Turkey Burger here is not just the typical ground meat flavor that gets covered by ketchup or some sort of mayo, no the meat is incredibly flavorful and savory with hints of herbs and spices visible. For a spread, they use a chili aioli that I'm dying to recreate and served up with a side of your choice. 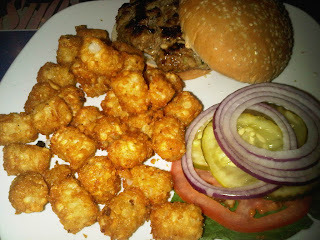 When given the option, I'll always pick tater tots :D The only thing I was yearning for was that slight crunch texture from a toasted bun when biting in. I'll ask for that next time. I was asked recently if being a food snob ever gets tiring and I said the more you expand your palette the more you find to enjoy :D I'm still avoiding as many commercial chains as possible but sometimes the french fry even gets the best of me. As Alton Brown would say, "I bid you good eating" till next time !